All right. We're stretching back a ways this time around and featuring a sort of quintessential Retro Friday book--one written by a very well-known author but oft overlooked in favor of its famous big sib. I know there are plenty of you The Witch of Blackbird Pond fans out there. I am one of you. How could you not love wonderful, brash Kit Tyler? And Hannah and Nat and Mercy? I loved it back when I was a little girl and my mom read it to me and I love it now when I re-read it for myself. 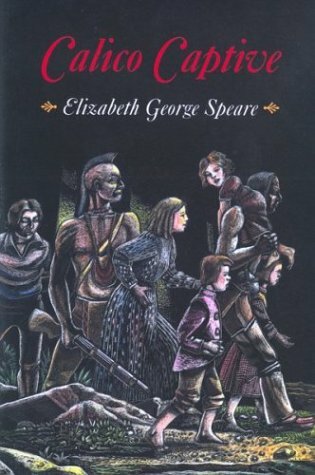 In fact, after I finished it the first time, I immediately ran out to find what else Elizabeth George Speare had written and the first one I came across was Calico Captive . I immediately liked the cover and the bright yellow spine. I read the back (back when I used to engage in that dangerous activity) and hoped that this Miriam would be as endearing and interesting as Kit. Her adventures seemed to be even more wild and that gave me an additional dose of hope. I'm always in favor of a good swashbuckle or two. I own the above middle copy and I actually think it represents the story quite well, early nineties styling and all. In many ways, Calico Captive echoes the richness and beauty of The Witch of Blackbird Pond , and at the same time it is quite a different story. 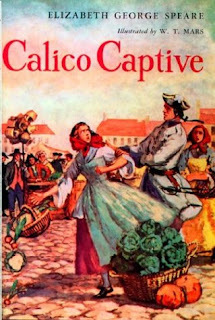 First published back in 1957, Calico Captive is based on a true story and was actually Speare's first novel. At times it is even more fraught with danger and the two heroines are very different girls, in search of awfully different things in life. Once again, however, Speare just hits it out of the park when it comes to the atmosphere of the times and her portrayal of women and the lives they led. Sixteen-year-old Miriam Willard lives with her family in the New Hampshire colony. And on the night in 1754 in which our story begins, she is experiencing her first real party. The soldiers from the nearby fort have come out for the occasion and everywhere there are candles and music and dancing. It proves to be everything she hoped it would be down to the lingering conversation at the end with quiet and handsome Phineas Whitney. Phineas is off to Harvard within a couple of weeks to study medicine and, with the French and Indian war still raging, he is not sure when he will see Miriam again. They would both very much like to continue their acquaintance and Miriam sends him off that night with high hopes they will get to know each other better over the next few weeks. Then, disaster strikes. In the middle of the night their homestead is attacked by Indians bent on capturing the family and marching them all the way to Montreal to be sold into slavery. The journey is harsh and dangerous and Miriam is terrified for herself and for her sister and her young children who are forced to make the march together. Separated in Montreal, Miriam fear she will never see her family again. Sold to an opulent and well-to-do French Canadien family, Miriam's life takes a bizarre and jarring twist as she serves as a ladies maid to the Du Quesne family. There she encounters a level of refinement and lust for life that she has never before fathomed. She also meets the coureur du bois Pierre Laroche and with such an acquaintance, it seems that many more cords slip around her, tying her to solitude and this strange land. Miriam is a survivor and that is what I like best about her. She never gives up on her family--her sister, brother-in-law, nieces and nephews. She is many times overwhelmed, threatened, angry, and frightened. Yet she never gives in to despair or hatred. I loved her time in Montreal because she was able to embrace the new culture, despite her appalling situation. She made friends with her captors and employers and she saw a different view of the world. I had no idea which way the wind would blow for Miriam in the end and, though I appreciated the fine attributes of both faraway Phineas and very-much-in-the-flesh Pierre, I was pleased with the denouement and the decisions borne of hope that Miriam made in the end. 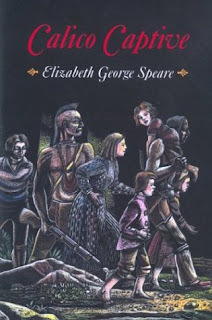 Ms. Speare excels at presenting both sides of every story, at showing every group from the Indians to the French nobility, to the stiff Puritan stock of New Hampshire, in both light and shadow so that the reader gets a feel for just why these wildly diverse groups were fighting. Through Miriam's eyes we are allowed to experience the world at that wild and significant point in time and I have never forgotten what I saw the first time I read it. The harsh reality of her place in the world and the grim and often unbearable truth of those around her haunt Miriam throughout the novel. She does not forget easily, yet she is also one of the only characters to push back against the dizzying tide. By the end, I believed she could do what she said she would because I had watched her adapt time and time again. A truly fascinating read and definitely recommended for Speare fans, as well as those interested in captivity narratives or the early days of North American settlement. I totally love this book. Elizabeth George Speare is a master of historical fiction. Why haven't I read this? I was the ultimate Witch of Blackbird Pond fan! Must remedy. I truly enjoy this little-read book of Speares. I like Witch best, of course, but this one has a well-worn place on my shelf. AHH! (that was excitement, not lunacy or fear) This is my favorite Speare book. It's the one I've re-read most, and I really do love it. I think I researched it in high school, and was surprised to find that it was based on a true story. Nice post! 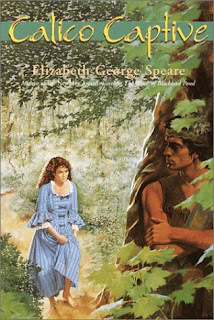 Another great book by Elizabeth George Speare is "Sign of the Beaver" It's probably in between "The Wtich of Blackbird Pond" and "Calico Captive" in terms of recognition, but it too is excellent. How did I not know about this book? I've read (of course) THE WITCH, BRONZE BOW, and BEAVER - but didn't even know about this one! Thanks for bringing it to light Angie! Oh I loved Witch of Blackbird Pond, but I hadn't heard of this one. I'll have to check it out at some point. Oh, ANGIE these books look oh so retro but I *so* want to read them now! Oh... I read this book years ago, when I was in ninth grade, I think... I remember loving it. Emily, she really is. You can always count on that aspect of it being solid. Stasia, my pleasure. Hope you enjoy! Melissa, ooh. It'll be right up your alley then. Raspberry, exactly. I've read pretty much all of hers and this one is my second favorite after WITCH. celi.a, how awesome you worked on it in school! And I'm delighted it's your favorite and has been loved so much over the years. Emily, I have read it! Glommed through most of hers after reading WITCH. Good stuff. Michelle, you betcha. Definitely look it up. Carla, LOL. It's definitely oh so retro. But if you haven't read WITCH or CAPTIVE you definitely should. I like this one and SIgn of the Beaver, but my favorite Speare book is The Bronze Bow. I also like the idea of "Retro Fridays." I hope to participate in the future. Sherry, it's been quite awhile since I read THE BRONZE BOW. I remember loving it. And you are welcome to participate in RF anytime!